These are some weird plants. We spotted them yesterday on a walk and I couldn’t stop and sketch so I took some photos (see end of post). They look like calla lillies except the part that’s normally white and yellow is nearly black and velvety with bright green stalks. 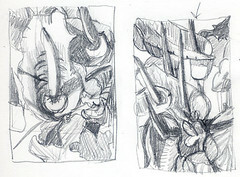 Last night I worked on some thumbnail sketches, trying to make sense of the jumble of leaves and flowers so that I could make a painting of the plant. “No, I live next door and I’m trying to get my house out of foreclosure. I get nervous when I see someone studying my house.” (I was sitting facing her house.) She left me alone after telling me the homeowners were away for the weekend but that she shouldn’t be telling me that. I love the way working outdoors incorporates all the senses. There’s a park nearby and I could hear kids playing soccer and neighbors discussing plumbing and babies, and the whole time I sat there I kept smelling something like fermenting grapes. With the rich purple of the plant, I imagined it was the scent of the flowers, but probably it was coming from a hidden compost bin. Here’s a photo of the plant. The pink color is a figment of my camera’s imagination but I like it. The flowers actually range from black cherry to black like the one in the foreground with wonderful variations in spring green foliage. I can’t wait to get started on the painting! WHAT A FLOWER!!!! LOOK S LIKE SOMETHING THAT ATE CLEVELAND!! LOL SUPER SUPER JOB, JANA! And congrats to you for risking the painting too!! I’ve been sketching out doors this week while the weather’s been warm — it is a delicious feeling to be among all the sensory experiences and the meditativeness of sketching!! It looks like some kind of strange horned beast. And its texture in the photo looks sort of fleshy … What a creepy flower! Lovely sketch, though! I just found your blog and wanted to say hi and I love your work. I am a retired garden designer, and thought maybe you would like to know what this plant is? It’s common name is Devil’s tounge or Snake Palm, depending on where you are in the world. This is the smaller decorative variety…perennial. They do tend to stink when in bloom…smells a lot like something rotten or a compost pile…but they sure a neat looking. Anyway…just thought you might like to know. I love your work on it. Good luck with the finished work. Fascinating flower and wonderful painting of it. Looks like a dragon that hatched into a flower instead. I wonder what it is!? You have done it justice, Jana. What a gorgeous black purple! Just dropping by to say Hi and see what you’ve been up to. I love these lillies and your interpretation of them. I’ve never seen anything quite that colour before – they are gorgeous. What a gorgeous flower and thanks to the comment above i now know what it is. I would have gone back also to paint it. your sketch is wonderful. What a creepy wonderful flower… and your initial painting really cool. can’t wait to see the finished product. love the reworked camelia and your glass bowl just shines! i came across this by chance. was looking for a way to identify some plants i’ve got, and i searched for “stinky plants”. I don’t like to contradict people, but i am not sure the plants/flowers in your picture are the devil’s tongue. 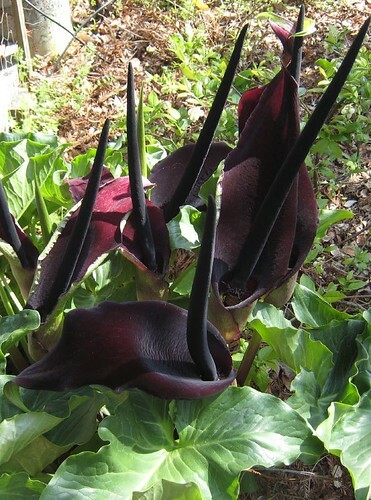 From my searches after I saw your picture, devil’s tongue is a kind of amorphophallus (not sure I spelled that right), while what you have in the picture is exactly what I have in the pot by the window, some kind of lily/calla. 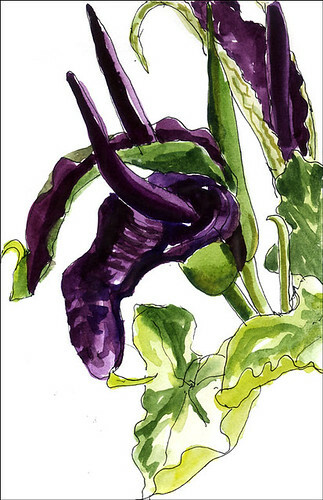 Oh well, your watercolor is wonderful and it really doesn’t matter the name of the plant… or does it? I am just trying to find the name of MY plant. We have seeds, but these grew in a neighbor’s garden and he passed away…his neighbor gave us some seeds. Will report back if the information is different. They did not have any smell that we were able to notice when we saw them in bloom. Best wishes on your hunt! I forgot to add – nice painting by the way! My Black Lily’s have just finished flowering, yea they are beautiful and thankfully, they don’t stink or small in any way. otherwise my wife would have made me dig them up and move them. I’ve had these rhizomes for over 30 years. Bert, would you mind selling me one or two of your black lilies? Sorry, but I forgot to add that their name is Arum palaestinum. I have been told to be careful of the seeds as they are poisonous. My mother inlaws have only just finished flowering, I was hoping to post a photo of hers, as mine have finished. I have a plant like this and it does not stink nor draw bugs. It does not have seeds. It has bulbs that do multiply. The leaves are nearly as large as the seat of a lawn chair. Mine come out in Feb or March and are here for a short time and gone quickly. A beautiful plant. Funny how darker, more ominous looking flowers tend to be the ones that smell worse. Just when you want to learn to stop judging a book by its cover, its the ones that look ‘worse’ that smell worse after all, eh? It’s similar with animals: crows are the sign of foreboding ill news because they’re black and look evil – but conveniently enough, they pick on the flesh of the dead as well! Which just makes people hate them more. Sigh! you do not know how much this made my day. i have been searching for years to find out what the flowers are that my fiance’s grandpa planted in now our yard 40 years ago. Arum palaestinum. Thank you to the original poster for wanting to paint such an incredibly beautiful stink! 🙂 nice job!